Tag line: "They were seven - And they fought like seven hundred!" The moment you hear Elmer Bernstein’s booming musical score, certainly one of the most recognizable in motion picture history, you’re ready to ride with The Magnificent Seven. This is a movie that knows what fun is all about. The vicious bandit, Calvera (Eli Wallach), leader of a group of criminals and cutthroats, has been terrorizing the citizens of a small Mexican farming village for years, forcing them to turn over their food so he and his men will have something to eat during the winter months. To end Calvera’s dominance over them, the villagers implore the assistance of Chris (Yul Brynner), a professional gunman, to run Calvera and his men off for good. Realizing he can't do it alone, Chris rounds up six more hired guns, including the quiet but effective Vin (Steve McQueen), the proud and determined Bernardo (Charles Bronson), and a brash newcomer named Chico (Horst Buchholz). With seven experienced gunmen backing them up, the villagers face off against Calvera; leading to a showdown the bandit won't soon forget. The Magnificent Seven is a Hollywood remake of Akira Kurosawa’s renowned classic, The Seven Samurai, a film produced in Japan six years earlier. Aside from duplicating the fast-paced adventure of the original, The Magnificent Seven also copies its predecessor's success in building a number of well-rounded characters. Eli Wallach’s Calvera has a venomous humor about him, always stealing with a smile plastered on his face; that is, until the villagers rise up against him, at which point his condescending grin all but disappears. As for the seven title characters, each one evolves beyond the caricature of a simple gunfighter to become something more substantial. Lee (Robert Vaughn) signs on to help, yet has his own reasons for doing so, namely the desire to find a safe hiding place from his enemies, who are hot on his trail. At the outset, Chico is little more than a cocky kid (one villager comments that Chico is very young, and very proud, to which Chris replies, “The graveyard is full of men who were very young and very proud”), and while his arrogance serves him well early on, he will learn the value of discipline and restraint from his more experienced cohorts. Rounding out the seven are Britt (James Coburn), who’s as quick with a knife as he is with a gun, and Harry Luck (Brad Dexter), an old friend of Chris’ who joins up because he believes there’s gold hidden somewhere nearby. Even the villagers themselves undergo a transformation of sorts, and in so doing take on a personality of their own. Unable to even shoot a gun at the outset, they will learn to fight in ways they never imagined. Make no mistake: The Magnificent Seven is, first and foremost, an action film, and on that level it is a rousing success; any one of its shoot-outs is enough get your pulse pounding. But while the various thrills ensure The Magnificent Seven will be an exciting film, its the characters that make it a memorable one. I had enjoyed this movie many years before seeing Seven Samurai (not realizing how similar they were). As re-makes go, it is an interesting and highly entertaining adaptation - despite some sketchy casting. For me, the music is arguably the real star of the production. @Klaus: This was actually my 1st experience with the story as well, and came to SEVEN SAMURAI much later. As a whole, I'd have to say I prefer Kurosawa's film, but for sheer entertainment, it's hard to top this movie. hey boss, you might enjoy BATTLE BEYOND THE STArs IF MEMory serves me correct. its a sci fi version of the story with oh well guys you dont know prop. congratulation s that was my first comment on a blog. @lokeydaniel: Thanks for the comment (and I'm honored you chose my blog for your first one!). I've heard of BATTLE BEYOND THE STARS, but haven't seen it as yet. Yes, it is another telling of this same story, and I know it stars George Peppard. There's actually an updated Blu-Ray release of the film coming soon, so I'll have to check it out. 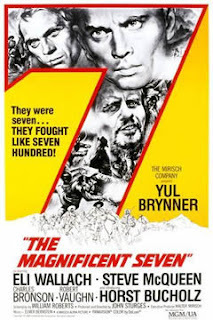 Interesting in that Kurosawa made "Seven Samurai" due to his love of westerns....."Magnificent Seven" made because of the love of the Kurosawa film. @MarkusWelby1: Yes, it is interesting. This is a story that lent itself perfectly to the Western genre, which, as you say, must have been what drew Kurosawa to it in the first place. Unlike many 'Hollywood' adaptations of foreign films, this is one that seemed a natural fit, and I'm happy to have both of them.